The American Association of Adapted Sports Programs, Inc. developed wheelchair football in 1996. Highly adaptive and fun, the sport has continued to grow in popularity since it was introduced. Adaptive football is open to people of all ability levels who enjoy the game and want to get in on the action. There are different variations of the sport, based on the league organizing the games. Participants use a standard-sized foam football. Players on the team who have functional use of their hands, arms, and eyes catch the ball and throw it to score touchdowns and field goals. The game may be played indoors on basketball courts or outdoors in parking lots or outdoor courts. The standard field size is 60 x 25 yards and it is divided into 15-yard segments with the end zones measuring eight yards in length. Manual and motorized wheelchairs are used in play. Teams are often coed and consist of players with a range of capabilities. The standard team size is six. Though, teams may comprise of anywhere from five to 14 players, depending on the size of the "field area" or pitch. In addition, a wheelchair football team may have a number of alternates who are called in the game to play. Adaptive football players are classified into three different levels, and the rules of play are slightly different for each level. Level 1 players have full use of their arms, hands and eyes. Level 2 players have limited arm and/or hand movement and may have some type of visual impairment. Level 3 players have no arm-movement capability and/or have limited sight. The rules for Level 1 players are somewhat similar to "touch football," where players touch rather than tackle their opponents. In that adaptive game, the player - and not his or her chair - must be touched to count as a tackle. Players who have limited or no mobility in their arms use chair-to-chair contact for blocks and tackles. As noted above, playing the game varies based on situation and player ability. 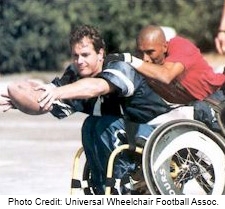 Though, the basic rules are set by the Universal Wheelchair Football Association (UWFA). Kick offs, punts, runs, and goals are all scored using the hands for Level 1 competitors. For Level 2 and 3 players, points for pass completion are awarded if the ball hits the player in the area between the hands and their elbows. Although the players cannot grab the football, they still need to maneuver their wheelchairs so they can be in the right position for the ball to hit the right place to score. The Blister Bowl (held every year in Santa Barbara, California) is the country’s most popular tournament of wheel chair football. For more information about playing adaptive football, click here: Wheel Chair Football.